Rudy Vallée was a very popular singer, saxophonist, teen heartthrob (! ), bandleader, radio personality and movie star, who developed a slightly stuffy, slightly ridiculous air about himself in his later film appearences. He had a very long career. Born to French Canadian parents, Vallée greew up in Westbrook, Maine. When America entered World War I, 15-year-old Hubert enlisted in the Navy and served 41 days before authorities discovered he was underage. A drummer, Hubert learned the clarinet and saxophone and spent his high school years in various New England pickup bands. In 1924, Hubert joined the band at the Savoy Hotel in London, England, then returned to obtain a degree in philosophy from Yale University, where he played in the Yale Collegians at the height of the Roaring 20s. 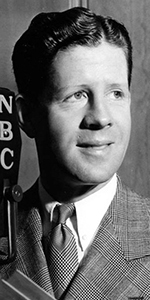 After he graduated, he took the name of his saxophone idol, Rudy Wiedoeft, and styled his band "Rudy Vallée and the Connecticut Yankees." Vallée began signing at the band gigs, where his reedy voice and boyish charm swept young girls off their feet. He was signed to a recording contract in 1928, and began appearing on radio. He became the first of the "crooners" who utilized microphones and amplification to sing softly and loudly at the same time. He sang as though he was another instrument, sometimes through a megaphone. His concerts were packed with flappers who found his singing thrilling. Vallé was also a songwriter. Some of his songs include "Oh! Maa-Ma! (The Butcher Boy)," "Deep Night," "If You Haven't Got a Girl," "We'll Never Get Drunk Anymore," and "I'm Just a Vagabond Lover. "In 1929, Vallée became the host of The Fleischmann's Yeast Hour radio program, where the song "My Time is Your Time" became his themesong. Vallée stayed with the show until 1939, but continued hosting similar programs into the 1940s. Vallée was brought out to headline in the movies by R-K-O Radio Pictures, where he made The Vagabond Lover (released in December, 1929). Although the film was a hit, Vallée couldn't really "carry" a picture. So R-K-O put him and his band in a number of musical short films. Switching to Paramount, Vallée played himself in International House (released in May, 1933), and headlined in George White's Scandals (released in March, 1934) and Sweet Music (released in February, 1935). As he grew more comfortable before the camera and acting, he took supporting roles in films like Second Fiddle (which played the Chinese in July, 1939), but could still headline, such as in Universal's Too Many Blondes (released in August, 1941). Vallée joined the stock company of director Preston Sturges, appearing in The Palm Beach Story (released in January, 1943), The Sin of Harold Diddlebock (Mad Wednesday, released — sort of — in April, 1947), Unfaithfully Yours (which played the Chinese in December, 1948), and The Beautiful Blonde from Bashful Bend (which played the Chinese in June, 1949). It was in the Sturges films where he developed his persona of being a pleasant foppish nit-wit. During World War II, Vallée returned to the sea, becoming a Chief Petty Officer in the U.S. Coast Guard, directing the Coast Guard Band. He was promoted to the rank of Lieutenant. in 1944, he returned to his radio career. Post-war films for Vallée include: The Bachelor and the Bobby-Soxer (released in September, 1947), I Remember Mama (released in March, 1948), Mother Is a Freshman (which played the Chinese in March, 1949) and Ricochet Romance (released in November, 1954). Vallée guested on many television programs, including Kraft Theatre (in 1958), On Broadway Tonight (in 1964), Batman (in 1967), Petticoat Junction (in 1969), Night Gallery (in 1971), Alias Smith and Jones (in 1971-72), Ellery Queen (in 1976), and CHiPs (in 1967). In 1961, Vallée created the role of J.B. Biggley in Frank Loesser's musical comedy How to Succeed in Business Whitout Really Trying, which ran for four years and 1,417 performances on Broadway. With his voice now in the baritone range, Vallée recorded an album of standards in 1967, released as Hi-Ho Everybody. That year also saw him starring in the film version of the stage hit How to Succeed in Business Without Really Trying (which played the Chinese in March, 1967). He also recorded the narration for the film The Night They Raided Minsky's (released in May, 1969). Rudy Vallée died of cancer at his home in 1986 at the age of 84. Grauman's Chinese Theatre, Hollywood, California. Rudy Vallée Forecourt ceremony, Monday, July 21, 1941. 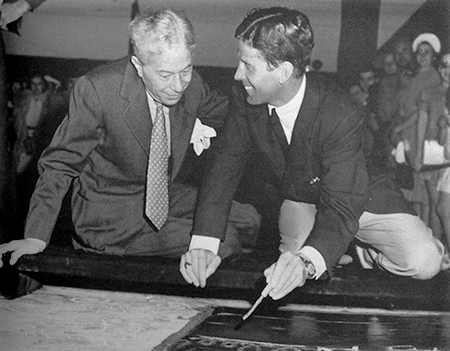 Sid Grauman looks on as Rudy Vallée finishes signing his name in the cement.